A popular method of suspending the usual rules so that a different story can be told; dreams have a number of narrative purposes and provide a source of images, connections and messages that inspire and fascinate. Antagonists with fewer restraints. 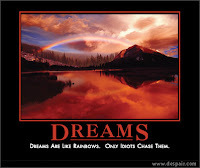 An example is Dreamscape where an assassin kills their target in a dream and it translates into reality. The proverbial example is of course Freddy Krueger and the Nightmare on Elm Street series. Symbolic associations. Dreams can often contain symbolic references to situations and events - Salvador Dali often used dreams to inspire his art. Care needs to be employed - symbols can mean very different things to different audiences. Unusual environments. From the baroque fantasy of H.P.Lovecraft's Dreamlands to the structured psychodramas of Werewolf: The Apocalypse, the realms of dream let you kick the jams and portray settings that juxtapose environments. Prophetic dreams are a particular example of how dreams can provide information to characters which have direct application. One of the particular problems is saying enough without saying too much or being obtuse. Interpreting dreams is something which has always been of value, from shamanic visions to psychotherapy (more on that later). Dreams not only offer foreshadowing but also insights into a situation or a character; this is close to the real world experiences of Einstein and Kekulé. Recurring insights often take the form of a message to be acted on - for example Stephen King's The Shining where the Torrance family are plagued by the ghosts of the Overlook and Jack Torrance's own demons. A link found at H.P. Lovecraft & His Legacy discusses lucid dreaming in psychotherapy and this reminded me of the dreamscapes of Quiet sufferers in Mage: The Ascension. Getting into a shared dreamscape with an insane person may be risky (one example is The Cell) and possibly infectious. Walking in such places requires caution. How have you used dreams to inspire game events or tell your stories?